Hey there, dear shopaholics! It is summer once again and the temperature keeps on rising. Looks like you deserve a 3 DAY SALE at SM to beat the heat! Just few days ago, a record high of sweltering 36.2 degrees has just been reported by PAGASA. Despite the heat though, don't you think it's high time to go to the mall and shop till you drop? When moving FORWARD, don't let anything or anyone hold you back... especially if it's a 3 Day Sale! 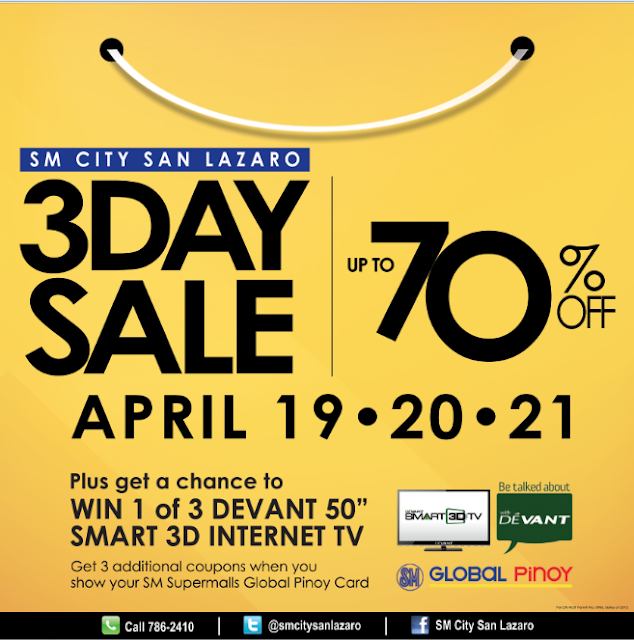 Like what I've mentioned on my previous blog post here, SM City San Lazaro is now having the hottest 3 day mallwide sale you can't dare to miss! Oh and heads up, guys! You still have until tomorrow to shop on sale! 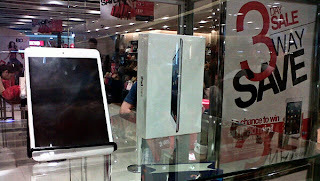 Last Friday, I took a trip to SM City San Lazaro to experience its 3 Day Sale and it was way hotter than the midday sun! I was trying to decide which crowd I want to dodge though: the weekend gym crowd or the crazy 3 Day Sale shoppers. I chose the latter. :) It's a sizzling three-day Sale showcasing the leading brands, with sunny discounts up to 70% off! Crazy shoppers enjoy big discounts in bags & luggage, shoes, men’s and ladies’ fashion, sporting goods and accessories, swim wear, eye wear, appliances, gadgets and many more! First, be prepared to wait at least 2 hours to fall in line. And by line, I mean long lines. Can't believe I missed the SMAC 2-Hour Special (10:00am-12:00nn only) because of the horrible Friday traffic! Advantage card holders enjoyed and took advantage of the SMAC 2-Hour Special because they were able to avail the additional 10% off on top of the 50-70% off on selected items!!! With the line curving past the end of the escalator, about 40 people or more were patiently waiting and standing in line. Of course, there's the usual security and bag check in effect. At the 2-hour mark of being on the line, customers had big smiles on their faces because the long lines are definitely worth it. There were a huge selection of shoes, bags, dresses, shirts and practically everything you see with a huge discount up to 70% off. There were also a handful of toys, accessories, and appliances for the taking. Also, there were quite a few long sleeve button down shirts as well as other apparels for women and kids. There were large racks with shirts and swimwear items of different discount rates. Incredible savings with big discounts on great finds! I was intrigued by the collection of polo shirts (mainly cotton) in different colors and patterns/prints with a whooping 50% off. There were also a number of dresses in similar colors as the skirts. Fab Dickies shades at 50% off! Overall, there was a nice mix of summer hues and colors. Most items are 30-50% off, with a few selected items being 70% off. And mommies, this sale also features men’s items so grab your hubby or significant other and make it a his and hers shopping spree! For the feisty types who want to maximize their shopping experience, join the raffle draws because at SM City San Lazaro, shoppers and shopaholics are always in for a treat. Aside from buying your favorite brands at a discounted price, there will be a raffle draw of 7 iPad minis and you also get a chance to win 1 of 3 DEVANT 50" SMART 3D INTERNET TV! Now this will truly make this SALE event worth going to and it's sure to make your shopping experience a satisfying surprise! SM City San Lazaro also offers free ride for their loyal shopper's comfort and accessibility. Free ride meaning drop off only from LRT Tayuma to mall from April 19-21, available from 10 am- 6pm. They also have 2 redemption areas to claim raffle and free parking coupons. One at the UGF Main entrance hall across Pizza Hut and Starbucks and the other one at the UGF event center. I definitely had a very fun 3 Day Sale shopping experience at SM City San Lazaro! Only SM Supermalls gives you this kind of shopping experience! This is a crazy sale and it won't last long... so hurry, because it ends tomorrow! Go grab some of these crazy discounts pronto! One more thing, here's a tip; never go shopping on an empty stomach, you end up missing loads of things on sale you won't even have the energy to prowl and grab some great finds! Good thing I stopped by at Wendy's for a great grub. This place is a staple if you are looking for frosty and burger fix before you start a whole day of shopping galore! Also, don't forget to check out the new stores at the mall; Chicken Charlie, Sisig Hooray, DQ Express, Potato Corner, Globe Telecom and In a Nutshell! I have been to the Sm San Lazaro sale last year and I have bought so many things like my kid's shoes, bedsheets, clothes etc. Have saved lots of money. girls like us really love shopping! ^_^ plus cooling down in the mall is really a great way to beat the summer heat! Yes I've been in SM San Lazaro last Friday and theres a lot of shopper and been so crowdy, because its worth it even it took hours to fall in line in the counter area but I take the oppurtunity to bought school supplies that are on sale like bags and sandos I also took a free ride from LRT Tayuman to SM. It seems like yesterday that I was in SM San Lazaro but it was a year ago when I still live in Sampaloc. It was a great shopping experience with my family even though there are many people goes for shopping, it was still worth it because I remember I bought two jeans because it was on sale. OMG. Hopefully the sale would be that huge next time here at Makati.